One of the factors that separates good cooking from great cooking is stock. Stocks bring far more to the table (no pun intended) than most people think. While they are really just flavored water, when cooked and used properly stock contribute flavor and texture that water just doesn’t do; and leaves your guests asking “Why does your food always taste so great?”. 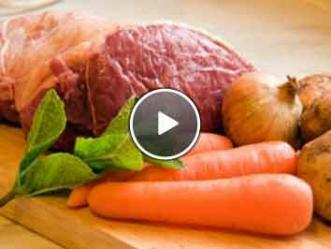 In this cooking video, I show you how to make a beef stock. I use stocks mostly when I’m making soups and sauces, but also when I just need to add a bit more moisture and flavor to a dish. Beef stock does take some time to make well, so rather than making it “on-demand”, I make very large batches and then freeze the stock in small quantities to pull out when I need it. Reducing is your friend. You can’t really over reduce the stock. As you simmer it, more and more water evaporates, and the flavor concentrates and while you’ll have less volume, it’s flavor is stronger, so you need less of it. However, if you don’t let it reduce enough, you’ve got a “flabby” beef stock that no one gets excited about. It’s important to get the bones and beef well roasted, with a good dark color. You can roast them either on the stove top, or in the oven. If you want to keep your cooking to one pot, simply load up your stock pot, put it in 375 degree oven and let it roast for about 2 hours but more importantly until they are nicely browned. Alternatively you can sear the bones & meat over the range, once you get a good caramelized color on them, put them in the oven for about an hour. That method is a bit faster, but it’s also a bit more work. Add the wine, and deglaze the plan. Let the wine reduce by half. Does your chilled stock look like Jello? If so, that’s totally fine. That’s the collagen in the meat that’s broken down, and when cooled it gelatinizes, just like jello. If you heat it up the stock it will turn back into a liquid. And the nice part, is the viscosity of the stock helps thicken sauces. I like to pour mine into ice cube trays, then freeze it. I’ll then pull a few “cubes” out of the freezer as needed. As I said, making your own beef stock does take some time. But if you do it right, you can make a large batch and a little does go a long way. There’s also no doubt that your food will taste better.